In 1602 William Shakespeare negotiated with John Combe for the purchase of 107 acres for £320, a considerable sum. Two copies were made of the deed conveying this land. The Combes signed the purchaser’s copy, which was filed with Shakespeare’s title deeds. Shakespeare was not present at this final stage in the proceedings, his brother Gilbert receiving the signed deed on his behalf. The second copy, shown here, once bore a single seal but was left unsigned. 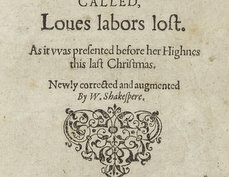 It too was later found among Shakespeare’s title deeds. There are two possible explanations for the survival of this unsigned counterpart amongst Shakespeare’s deeds. It could have been prepared for Shakespeare to sign when he was next in Stratford. However, if he had not done so, and had the Combes never asked for it, it would have remained parcelled up with the purchaser’s copy. There is, however, another possibility. 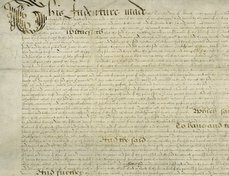 It had been the convention that deeds should be written out twice on a single sheet of parchment which was then cut into two along a wavy line (hence the term indenture), each party to the deed then receiving his or her copy. In the case of any disagreement, the two versions could be brought together to check their authenticity. 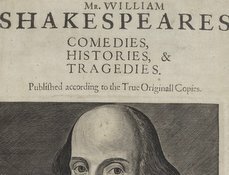 By Shakespeare’s time it was by no means certain that such conventions were universally observed and, in this instance, the fact that the indented edges of the two documents do not match may not be significant, especially as they are written in the same hand. However, the unsigned copy contained an error, requiring the scribe to insert an omitted clause, soon after the words, in large letters in the image above, “To have and to holde.” It is therefore possible that the deed was re-copied in its entirety and then signed by Shakespeare before being handed over to the Combes, leaving the rejected copy, shown here, in Shakespeare’s hands. 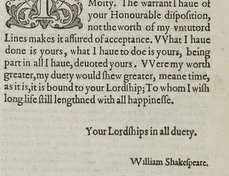 Regardless of the status of the copy prepared for Shakespeare shown here, both it and the purchaser’s copy clearly remained parcelled up with later deeds relating to Shakespeare’s estate until ca. 1800, when R.B. Wheler, the Stratford historian, removed them. They were later found in his papers given to the Shakespeare Birthplace Trust in 1863. As the unsigned copy was thought merely to duplicate the purchaser’s copy, it was given to James O. Halliwell-Phillipps who recorded this transaction in a signed endorsement on the verso side, citing a letter of January 10, 1863 from the secretary of the Birthplace Trust, on his giving “an equivalent donation to the Museum.” It then found its way into the collections of the earls of Warwick. It remained at Warwick Castle until its deposit in 1972 at the Shakespeare Birthplace Trust, who subsequently purchased it after it had been withdrawn for sale. the daie and yeare first above Written 1602.